Aufhauser CopperFil is used for the inert gas welding of copper base alloys. For example: copper-silicon, copper-zinc, and galvanized sheets. May also be welded to steel. This wire is frequently used for joining in artistic foundries (i.e. sculpturing, architectural detailing). 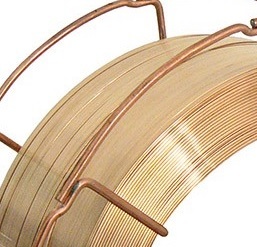 The automotive industry has chosen CopperFil over steel wires because of its lower melting point. This lower melting point results in higher travel speeds, better wetting, better gap bridging and even excellent corrosion resistance.